For sophomore exercise science major Patrick Pang, the opening of the newly renovated Hawk’s Nest dining hall at University Suites has, despite minor hiccups, been an overall positive experience. “I think it’s really cool. It would have been better if it had been open when it was initially scheduled last year, but other than that it’s great. The wait times and lines can get a little long, especially after 7 o’clock, but other than that it’s been great. Far better to us than Fox,” said Pang, who resides at University Suites. Pang’s sentiments have overwhelmingly been mirrored for the average 370 students who visit Hawk’s Nest each night in the opening weeks of the fall 2018 semester. Initially slated to open late in the 2017-18 academic year, the dining hall faced a small handful of construction setbacks but was brought to completion in the closing weeks of the spring 2018 semester. With a new academic year underway at UMass Lowell, the ovens and grilles are hot, and students are being served. In fact, last Thursday, the Hawk’s Nest served a peak of 490 students. “From where I stand, it’s been a grand slam. It is accomplishing everything we hoped to accomplish,” said Larry Siegel, Associate Vice Chancellor for Student Affairs. The Hawk’s Nest was designed to meet the needs of a growing on-campus community, provide a buffer to the ever-busy Fox Dining Commons and bring the students of East Campus a place to have dinner later into the evening on weekdays. So far, UMass Lowell administrators are incredibly happy with their product. “The whole goal was, with the addition of River Hawk Village making the already taxed numbers in Fox Dining Commons an even more detrimental experience, to create a space that would take stress off of Fox and provide a better experience for our students,” said Siegel. The newly refurbished location, complete with mobile order kiosks, offers students a number of new and delicious options for each of the universities offered means of payment. 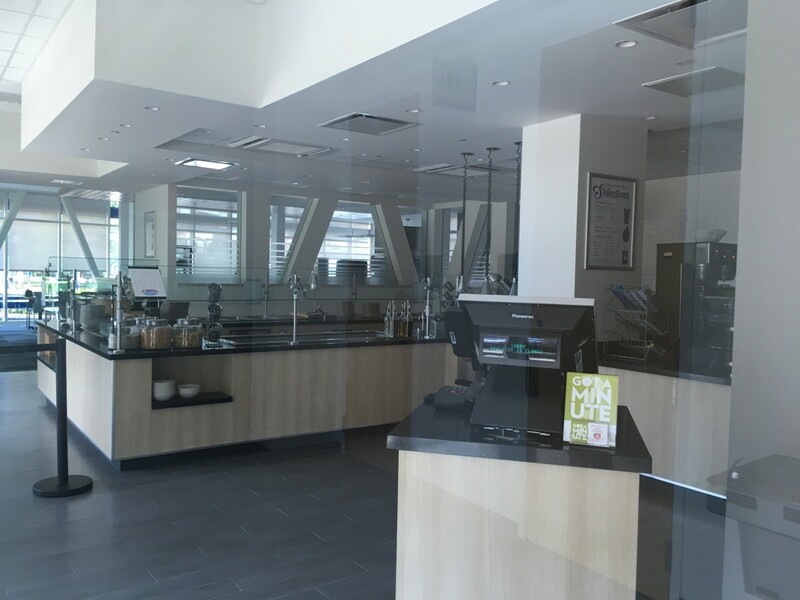 Alongside the university’s typical swipe to access all-you-can-enjoy offerings, the space is also equipped with a made-to-order sandwich and grilling station while offering popular menu items from the previous Hawk’s Nest for purchase with River Hawk Dollars such as smoothies. The dining area is completed with a unique “Delicious Destinations” station which serves an array of meal offerings from different cultures and ethnicities each week on an eight-week rotation. “It’s pretty nice because there’s enough seating for everyone that comes here. It’s not chaotic like Fox. The food quality is great, definitely better than Fox. Better variety of food here,” said freshman math major Genevieve Moore. All the excitement and work surrounding the opening of the new location is bound to bring about hiccups. And administration was transparent in the fact that the construction and opening process posed several new and unique challenges for the university. In regard to construction, Siegel explained that the process went swimmingly, but in the closing weeks, plumbing inspectors asked that the piping to the kitchen be switched out for larger piping, an issue that required the floors and several feet of concrete beneath be cut through to replace the system and added substantially to the project calendar. Another concern was the exit closest to Aiken Street would have to be made into an emergency exit or manned by another University Dining employee to tap residents into the dining hall. In the opening days a couple of residents, not realizing the change, set off the alarm as they attempted to exit the building. Until a more concrete solution is in place, trash cans have been placed in front of this exit to prevent the error. Construction and space issues were not the only matters facing the university in the opening process. Still being worked out is the issue of numbers. With so many students drawn to trying the new dining spot on campus waits can get a bit long for items that require preparation, and some students have even reported their food being snatched up by less patient peers. “The wait itself can a little intense, especially around seven o’clock. Sandwiches tend to take a while, particularly the grilled chicken which also comes out pretty overcooked at times. And when the waits get real bad, I’ve even heard of people getting their food stolen,” said sophomore clinical psychology major Joe Govoni. With food quality already exceeding expectations for most students and the excess traffic expected to die down as the newness of the facility wears off, it is highly expected that the new dining hall will more than stand up to the goals and expectations of UMass Lowell administration. As minor wrinkles are smoothed out concerning wait times and process, the Hawk’s Nest will undoubtedly provide East Campus residents with a more convenient, less stressful and overall positive dining experience they are already starting to see at University Suites.